The Liverpool Pembroke Sefton Young Athletes were at Birmingham for the National Road Relay Championships. In this fiercely competitive event the Under 13 squad did well to finish 8th team. Jake Helm led off with a sparkling 13.50 leg followed by Mike McCarten in 14.39 and anchor man Chris Hesketh on 14.19.Over at Heaton Park, Manchester the Senior men were engaged in the Northern 12-Stage relay, a mixture of 5 and 3 mile legs. Star performer Jimmy Boardman led off in a sound 9th position and the club stayed in contact with the stronger clubs for six stages before succumbing to later pressure and finishing 29th. Three of the club`s promising youngsters contested the short stages with Rob Stocks on 15.43, Michael Rimmer 16.03 and a very brave Carl Williams at 16.21. They were not intimidated by the many class seniors around them and the club`s future looks in good hands. 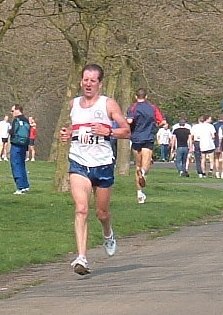 Meanwhile at Croxteth Park Jimmy Boardman lost out narrowly to Liverpool Harrier Phil McGlory in a sprint finish in the club-promoted 10K road race which attracted over 300 runners.